That is how much money left PIMCO’s Total Return Fund in October, bringing the fund’s assets under management to $US170.9 billion as of October 31, roughly 14% decline from the start of the month. Total Return is still the largest actively managed bond fund in the world, PIMCO said in a statement. PIMCO said that nearly half of these outflows occurred in the first five trading days of the month. 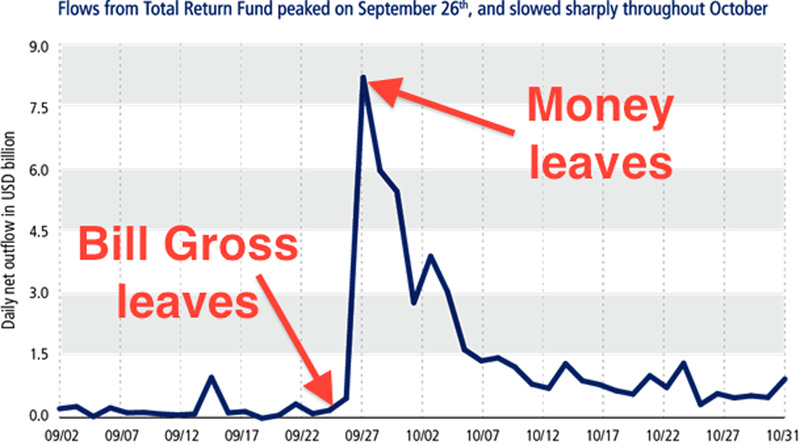 The outflows from the Total Return Fund followed the departure of PIMCO founder Bill Gross from the firm on September 26. Gross was one of the managers of the Total Return Fund. “Flows from the Total Return Fund peaked on September 26th, and slowed sharply throughout October. October performance of +0.80% after fees was in line with the Total Return Fund’s peer group,” said PIMCO spokesperson Daniel Tarman. Year-to-date, PIMCO’s Income strategies have experience $US13 billion of positive flows globally, the company said. Here’s a chart from PIMCO showing the outflows from Total Return during October. 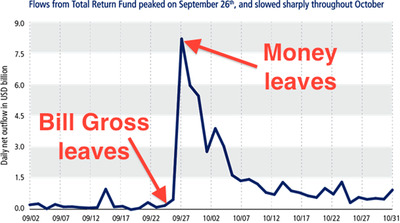 See if you can spot when Bill Gross left the firm.